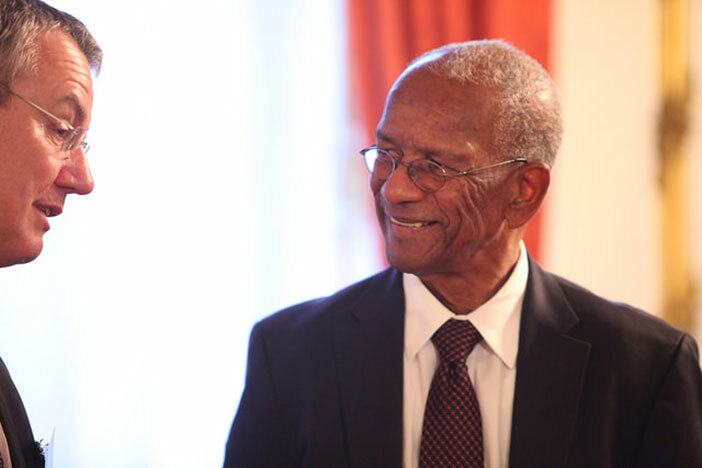 Premier and Minister of Finance, Dr. the Honourable D. Orlando Smith, OBE, has successfully concluded the 2015 Joint Ministerial Council meetings (JMC) held in the United Kingdom. The Premier held discussions on a range of critical issues with United Kingdom and Overseas Territories (OT) Ministers for the territory including economic development, environment, health and child safeguarding. The Premier also led discussions on infrastructure where he emphasised the importance of infrastructure development to all territories and encouraged the UK to support these initiatives, particularly with respect to tourism related infrastructure. The Premier also contributed to a debate on risks posed to the economies of the Overseas Territories in which he emphasised that OT Governments must adapt to a changing world economy in order to maintain their competitiveness. He said his Government has already commenced a wide-ranging programme of change through the BVI Forward Campaign, a far-reaching set of initiatives aimed at further strengthening the financial services sector by further improving the quality of the operating environment and developing a sustainable and exciting future for the industry. Premier Smith further stated that his participation in the JMC 2015 is an important dimension of BVI’s engagement with the UK Government and other Overseas Territories. The Joint Ministerial Council is an annual meeting that brings together United Kingdom and Overseas Territories Ministers to discuss UK-OT relations in a number of areas. Premier Smith was joined by Acting Permanent Secretary Mr. Brodrick Penn, BVI London Office Director Mr. Benito Wheatley and BVI London Office Acting Political Officer Ms. Jehree Clarke.